I am a firm believer that massage therapy can help almost anyone. Whether you are recovering from a sports injury or you carry stress in your neck from sitting at your desk all day, I believe massage therapy can help. It is important however, to realize that not all forms of massage therapy work for everyone. I work hard to ensure that I offer a range of techniques that can help the widest range of clients. From stiff stubborn muscles to a peaceful and relaxing time out from a busy life, Body Focus is here for you. During your first visit as part of the "Intake Process", I make it a point to understand what style of massage might be best for you and what part of your body needs the most attention. Below you will find a list of many of the styles of massage therapy that I offer at Body Focus Therapeutic Massage and I encourage you to ask questions. A form of back walking massage known as the “Deepest and most luxurious massage on the planet.” A deep compression massage where I use my body weight and administer pressure with my feet while using over head bars for balance. This style typically uses the heel arch and/or whole surface of foot, and offers large compression and tension with less pressure than an elbow. It is ideal for larger muscle groups, such as in thigh, or for long-duration upper back compressions. It’s a broad type of deep tissue massage that you will never forget. These sessions are often quite intense as a result of the deliberate, focused work. A full-body session consists of sustained deep pressure and is often recommended for individuals who experience consistent pain who are involved in heavy physical activity, or patients who have sustained physical injury. This style is also known as manual & manipulative therapy and is primarily used on the neuromusculoskeletal system to treat pain and disability. This physical treatment includes massage, soft tissue mobilization, and mobilization of joints. Most widely known as the pre/post massage for athletes and runners. Swedish massage is also referred to "Classic Massage" in other parts of the world and promotes relaxation, eases muscle tension and creates other health benefits. Ideal for the first time client where you might not yet know of how much pressure you enjoy. This new and innovative style of massage involves the use of bamboo sticks (warmed or room temperature) to knead and roll tight stubborn muscles to promote deep tissue healing and increase flexibility. Hands are used to work over the muscles (similar to other styles of massage) while the bamboo sticks are used to focus on knots. The result is a deeper and firmer massage. 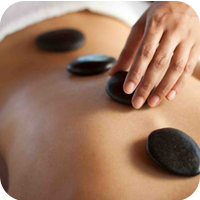 A specialty massage that uses smooth heated stones to ease muscle stiffness, promote circulation and melt away muscle tension. Pregnancy massage is specifically tailored for the expectant mother’s needs and is also referred to as pre-natal massage. This style of massage has been found to reduce stress, decrease swelling in the arms and legs and relieve aches and pains in muscles and joints. It's a popular alternative for coping with back pain, when choices for pain relief, such as medication, are often limited. Ashi-Thai is a combination of compressive techniques and passive stretches. These movements are an expression of traditional Thai Massage and have been modified for the use of overhead bars to avoid bending and lifting. The technique is performed fully clothed without any oils or creams.Many compare Ashi-Thai to Yoga without having to do any of the work. Muscle compressions, joint mobilizations and acupressure are also used during this session. If you plan on receiving Ashi-Thai, please come prepared with comfortable clothes.